Visiting Safaris and Korouoma Canyon will get you outdoors. Discover out-of-the-way places like Syote National Park and Syvasenvaara Fell. Step out of Rovaniemi with an excursion to Pyhatunturi in Pelkosenniemi--about 1h 30 min away. There's lots more to do: admire the sheer force of Auttikongas, pause for some serene contemplation at Rovaniemi Church, and don't miss a visit to Lordi's Square. For reviews, ratings, where to stay, and other tourist information, refer to the Rovaniemi trip maker app . Perth, Australia to Rovaniemi is an approximately 25-hour flight. You'll gain 6 hours traveling from Perth to Rovaniemi due to the time zone difference. Plan for colder temperatures traveling from Perth in April, with highs in Rovaniemi at 3°C and lows at -3°C. Cap off your sightseeing on the 15th (Wed) early enough to go by car to Saariselka. 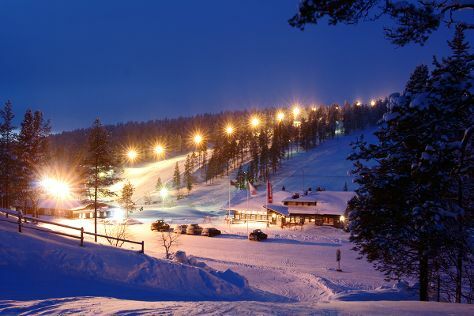 Visiting Saariselka Ski & Sport Resort and Nature & Wildlife Tours will get you outdoors. Step off the beaten path and head to Saint Tryphon Pechenga Orthodox Church and Lemmenjoki National Park. To see maps, traveler tips, photos, and more tourist information, read Saariselka trip planner . Drive from Rovaniemi to Saariselka in 3.5 hours. Alternatively, you can take a bus. In April, plan for daily highs up to 3°C, and evening lows to -6°C. Finish your sightseeing early on the 19th (Sun) so you can travel to Muonio. Muonio is a municipality of Finland.The town is located in far northern Finland above the Arctic Circle on the country's western border, within the area of the former Lappi province. 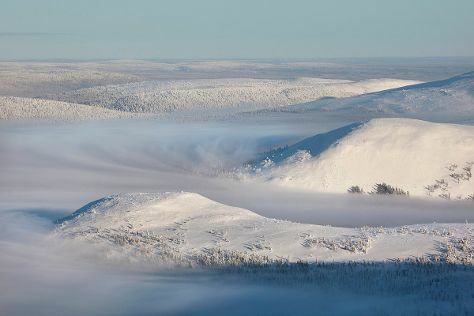 Start off your visit on the 19th (Sun): ski along the peaceful trails at Pallas-Yllastunturi National Park. On the next day, take in the architecture and atmosphere at Enontekio Church, surround yourself with nature on Torassieppi Reindeer Farm & Cottages, and then see the interesting displays at Muonion Kotiseutumuseo. To find maps, more things to do, traveler tips, and tourist information, you can read our Muonio travel itinerary planner. Drive from Saariselka to Muonio in 4 hours. In April, daily temperatures in Muonio can reach 1°C, while at night they dip to -7°C. Finish your sightseeing early on the 21st (Tue) so you can travel to Rovaniemi. Start off your visit on the 21st (Tue): see the interesting displays at Santa's House of Snowmobiles, explore the different monuments and memorials at German Soldier s Cemetery, and then get engrossed in the history at Arktikum. To see where to stay, traveler tips, reviews, and more tourist information, read our Rovaniemi trip planner . Traveling by car from Muonio to Rovaniemi takes 3 hours. Finish up your sightseeing early on the 22nd (Wed) so you can travel back home.